Jim Beam is the most popular brand of bourbon whiskey in the world. Jim Beam has two massive distilleries within 10 minutes of each other, they are located in Clermont, Kentucky and Boston, Kentucky and they produce over 90 brands, labels and variations of Bourbon and North American whiskey. Jim Beam Brands are owned by Beam Suntory, Inc., headquartered in Osaka, Japan but its North American Headquarters is in Chicago, Illinois. The beam family has been producing whiskey since 1795 although it was interrupted by Prohibition. Seven generations and direct line descendants of founder Jacob Beam have been involved in whiskey production for the company that makes Jim Beam. The seven generations and many branches off of the main Beam tree have earned the reputation as "America's First Family of Bourbon." The “Boehm” family emigrated to the U.S. from Germany in 1752. It was Nicholas Boehm (the father) who changed their last name to Beam to fit in, but he died at age 29. His widow Margaretha and five young children including Jacob L. Beam, at age 6 moved to Frederick, Maryland in 1766. They moved into a large plantation owned by Jacob’s uncle Jost Myers which is where they learned to ferment grapes into brandy and apples into hard cider and rye into whiskey. 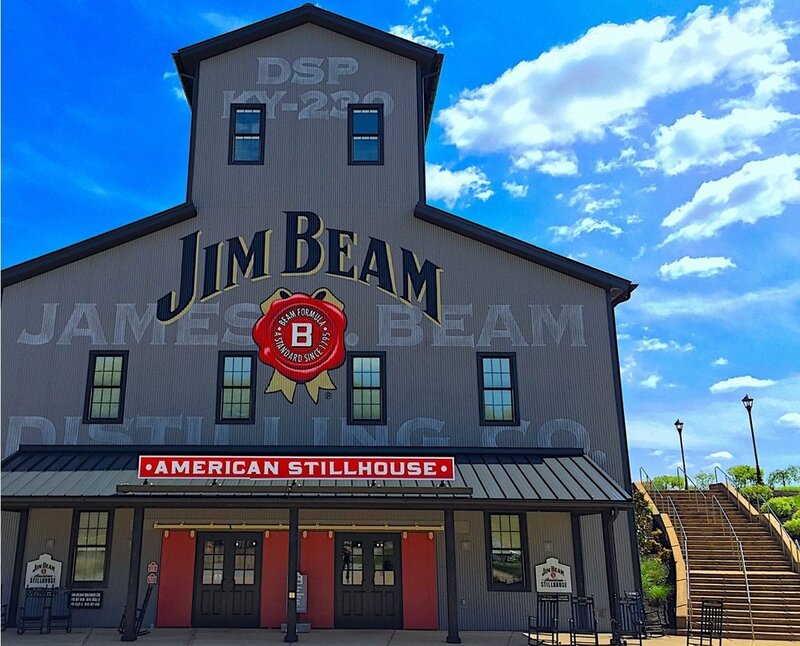 Jim Beam's American Stillhouse opened for Tours in 2014 in Clermont, Kentucky and instantly became one of Central Kentucky's leading attractions. In 1775 Daniel Boone and James Herrod cleared the Wilderness Road to Kentucky and storms of people moved in after General George Rogers Clark defeated the British in the Northwest Territory. Jost Myers was granted 800 acres in Kentucky for fighting in the Revolutionary War and he passed it on to family. In 1790 Jacob took his family through the Cumberland Gap on a long and strenuous trip and settled in Lincoln County, Kentucky. After 4 years of bumper crops of corn and other products on the 100 acres he lived on, Jacob began to distill his first whiskey in 1795. After the whiskey, he produced called "Old Jake Beam Sour Mash" became popular in his home county and another next door, he purchased the other 100 acre parcels from family and started planting and harvesting on all 800 acres. By 1810 he had sent his first Barrel of whiskey to New Orleans where they liked it and ordered more on a regular basis. Jacob and his wife Mary had 12 children and three continued on in the Bourbon trade. But it was his son David Beam that helped him most in the whiskey business. David Beam was as smart as a whip and learned in formal schools and from the industrial revolution going on around him. He expanded the distillery from a modest family business into a good sized factory, naming it the “Old Tub Distillery.” They transitioned from Pot Stills to one of the first companies to use Column stills in 1820. In 1822, at age 22, Jacob turned over the distillery and the business to David, who employed the Railroads and Steamboats to sell their whiskey at first to many major river cities and then to other large and mid-sized markets in the Mid-West and Northeast. It was during the 1820 & 1830's that the process of making bourbon in charred barrels (before this time most distillers just made corn whiskey) caught on and became popular. This process was adopted early by David and the Beam family. Some of the Staff of Whiskey University in the tasting room at the Jim Beam Distillery in Clermont, Kentucky. Pictured above (front row from left to right); Professor Lt. Colonel Dale Robinson, Professor Lt. Colonel Christopher Hart, Professor Colonel Craig Duncan, Professor Lt. Colonel Carl Ingrum, guest. Back row (l-to-r); Dakota Mercer, Casey Williams, Bobby Graham, Professor Lt. Colonel Ross Osborne and Professor Lt. Colonel Christopher Yow. The middle son of David, his father's namesake, David M. Beam stayed at home and eventually took over the distilling operation begun by his grandfather. Then in about 1860, David M. moved the family distillery from its original site to Nelson County, to take advantage of a new railroad line between Louisville and Nashville. It was at that time, "leveraging" the railroad that their bourbon became a national brand and they named it after their former distillery calling it "Old Tub Bourbon." David M. Beam had four sons but it was his two younger sons made quite a name for themselves in the bourbon industry. The older of the two was James Beauregard "Jim" Beam, born in 1864, who became the most famous member of the family. Jim worked closely with his father and younger brother, Park Beam, at the family distillery. The statue of longtime Master Distiller "Booker Noe" who worked at Beam from 1950-2004 helped to revolutionized the bourbon industry by inventing "Bookers" in 1988 and the "Small Batch Collection"
Jim Beam had two children, a son, T. Jeremiah Beam, and a daughter, Margaret. As soon as he was old enough at age 13, "Jerry" was put to work in the family distillery. His sister, Margaret, married Frederick Booker Noe, Sr. In 1920, the Beam operation was shuttered by Prohibition. After Repeal in 1933, Jere and Colonel Jim (almost 70 years old) purchased the old Murphy Barber Distillery at Clermont, Kentucky. They built a new plant within an astounding 120 days, renamed as the Jim Beam Company, and resurrected the "Old Tub" brand and adding a new brand called simply "Jim Beam" (its white label version today). In 1938 the Beams started making "Jim Beam Rye Whiskey." In 1946, Jere took over day to day operation of Beam Distillery and was joined by Park Beam (his uncle) and his two sons, Earl Beam and Carl Beam. Carl (known as "Shucks") was named Master Distiller in 1947, and Earl was his assistant while Jere ran the business side of things. It was Jere that turned Beam into a global giant, by first just making sure after World War II that any U. S. servicemen had access to Jim Beam worldwide. As the years went on Jere broke down international barriers and made Jim Beam available in country after country. Jim Beam retired from all duties in 1967. The "Dumping Porch" at Jim Beam's Small Batch facility. Jere renovated an old building and turned it into the "white house" that sat in the middle of the distillery property so he could be very close to the operation. Four master distillers lived in what was later known as the "T. Jeremiah House." They also mined a drinking well in the front yard of that house which they named "Jacob's Well" (which also became a brand of Bourbon along with "Jacob's Ghost"). As time went on Carl's sons, Baker and David, also went to work as Head or Master Distillers at the Jim Beam Company. In 1974 Baker Beam becomes Master Distiller at the Clermont Distillery and in 1978 the company releases "Jim Beam Black Label" a bourbon aged twice as long at eight years and sold at a slightly higher premium price. Booker Noe (Jim Beam's Grandson) became the 6th generation of direct line decedents of Jacob Beam when he joined the business in 1960. Back in November 1953, Jim Beam purchased a 450 acre mothballed Distillery (formerly called the "Churchill Downs Distillery") in Boston, Kentucky. Called the "JBB #2 plant," Booker was named Master Distiller of the JBB Plant #2 in 1964. In 2015, Beam Suntory renamed that Boston Plant the "Booker Noe Distillery." Booker was an innovator and is one of three men credited with saving and reinvigorating the Bourbon Industry. In 1988, Noe came out and with a bourbon called "Bookers" an uncut, unfiltered Small Batch Bourbon sold above 125 proof for an unheard of price of $35.00 at the time. By 1992, Noe was promoting what he called Beam's Small Batch Collection that included Booker's, "Knob Creek," "Basil Hayden" and "Baker's" (named after his uncle). Knob Creek has gone on to become the world's #1 selling super premium-bourbon. A display of Jim Beam's "Small Batch Collection" (released between 1988-1992) is arranged in a barrel pyramid just outside the Tasting Room next to "Warehouse H."
In 1992 Booker retired as Master Distiller and began traveling the world to promote the brand, he was succeeded by his son Fred Noe. In 2009, Fred startled the bourbon industry with "Red Stag," a black cherry flavored whiskey. That release helped flavored whiskies explode in popularity and spawned dozens of other brands and flavors. In 2011 Noe introduced "Jim Beam Devil's Cut" a stout bourbon that also extracted additional flavors from the barrel staves. In 2013 Fred released "Jim Beam Honey" and "Jim Beam Signature Craft 12 year-old Bourbon"
Jim Beam now makes over 90 different labels, brands or variations of whiskey. Their most popular bourbon brands listed in the article above include; Jim Beam White Label, Knob Creek Small Batch, Jim Beam Rye, Booker's Barrel Proof, Jim Beam Black Label, Jim Beam Devil's Cut, Basil Hayden, Jacob's Ghost, Old Tub Bourbon (their original bourbon brand), Jim Beam Signature Craft 12 year-old, Red Stag, Baker's Small Batch and Jim Beam Honey. Some of Jim Beam's other popular North American whiskies include; Old Grand Dad Bourbon, Jim Beam Single Barrel, Jim Beam Choice, Kessler's American Blended Whiskey, Old Crow Bourbon, Jim Beam Bottled-in-Bond, Jim Beam Apple, Jim Beam Double Oak, Jim Beam Maple, Knob Creek Single Barrel Reserve, Beam's Eight Star Whiskey, Basil Hayden Dark Rye, Alberta Premium, a whole line of Canadian Club Whiskies, Windsor Canadian, Tangle Ridge and many, many others.